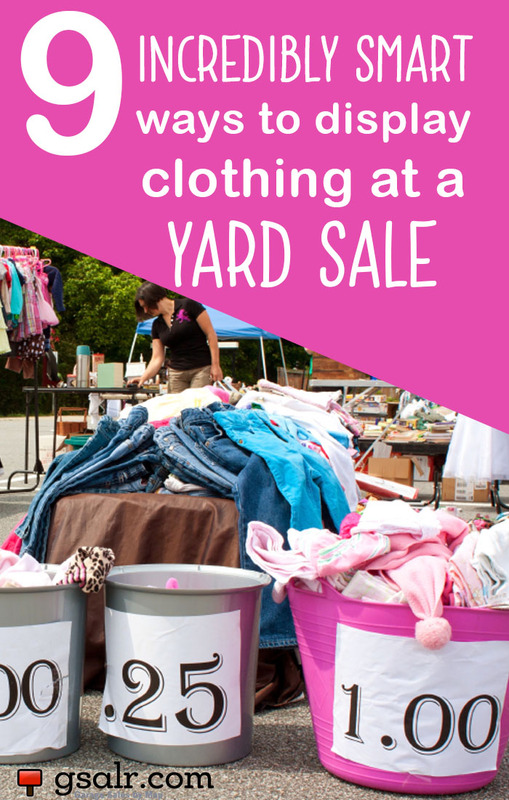 Not sure how to display clothing at a yard sale? No worries, we’ve got several ideas for you. 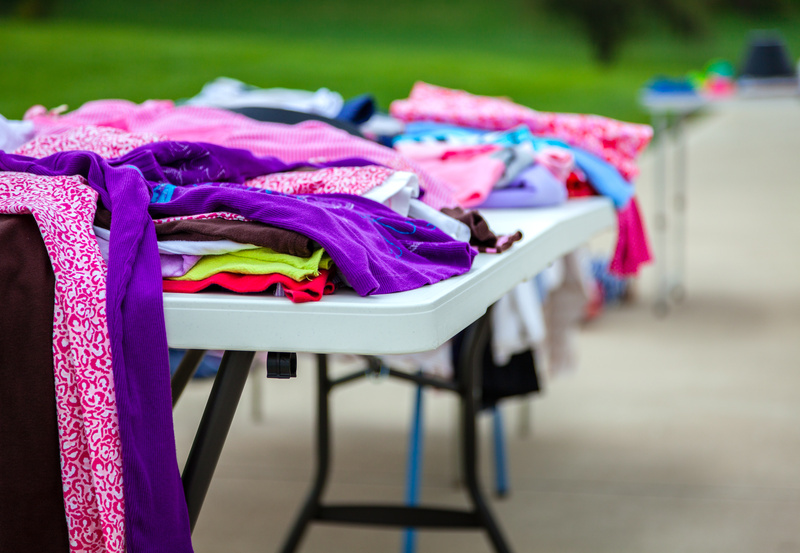 Figuring out the best way to display yard sale items can be a bit of a struggle for most yard sale hosts, especially when it comes to clothing. Clothing tends to be one of the most sought after items at a yard sale which is why it’s important to organize and display the pieces in an appealing way. Below we’ll take a look at 9 different ways to display & organize your clothes so that you get the highest dollar amount for them. Using a clothing rack to display clothing is probably going to be your best option. It keeps clothing off the ground, makes it very easy to sort through & most of all, it looks the most organized. One of the things we love about using a clothing rack is that we can organize the clothing inside of the house and easily roll it out into the yard once the sale starts. Because not everyone has a spare clothing rack hanging around, we found a slew of DIY clothing racks on Pinterest. Savvy yard salers have used everything from old ladders to a trampoline to display clothing! You can check out some of the wonderful ideas here. One other option you have is to display clothing in neatly folded piles on a table. Displaying clothing on a table keeps it off the ground and prevents the customers from having to bend over in uncomfortable positions to inspect the clothing. Plastic tubs are another great way to arrange yard sale clothing. You can start out by sorting the clothing by sizes & gender and using different tubs to display the clothing. At some point during the yard sale you may have to re-fold the clothing because tubs tend to be a bit harder to get through, which causes the clothing to become unfolded pretty quickly. Another way that you can display clothing at a yard sale is to place it in piles on the ground. If you decide to place your clothing on the ground you’ll want to use a sheet or blanket between the clothing and the ground to ensure that grass and dirt do not get on the items. Once you’ve decided where and how you’ll display your clothing, you’ll need to determine how you would like to organize it. 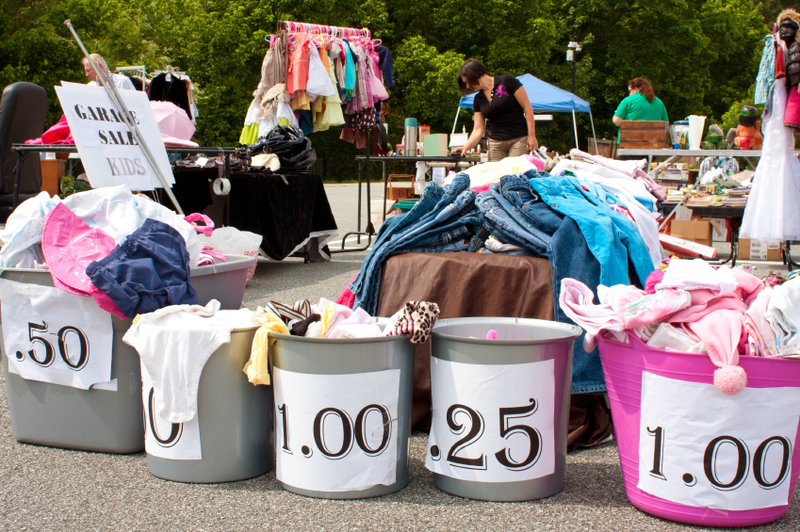 Below we will discuss some of the more popular ways to organize your yard sale clothing. If you are selling outfits or sets of clothing, it’s a good idea to place them together on a hanger or folded neatly together. This is especially helpful with infant outfits that can sometimes come with many matching pieces. If you are selling clothing at many different sizes, it’s a good idea to separate them out and identify them by sizes using signage. If you plan on selling both girls & boys clothing, plan on separating them out by gender. One other way you can display clothing at a yard sale is to organize it by clothing type. For example, you can have all of the shirts together, the pants together, dresses together, etc. This will make it easier for customers who are looking for a particular type of clothing.